Productivity ‘Hot Spots’ | Emphasis on Excellence, Inc. Throughout your days and your weeks, you have “hot spots” where you have the potential to be optimally productive. During this precious time, you CAN BE “in the zone,” working at “Mach 10,” or “on fire!” Whenever this happens (and it is actually quite predictable), you want to capitalize on getting things done that are of the most benefit to you - both personally and professionally. When are your optimum times? How can you track those times? Is it possible to extend your ‘hot spot’ time? Knowing is one thing. Doing is the other. 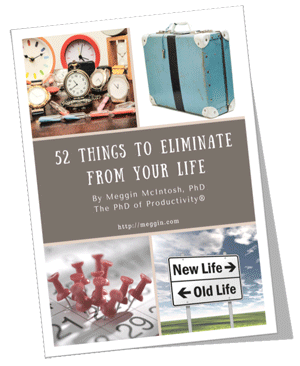 Let Meggin McIntosh, the PhD of Productivity®, teach you and inspire you to know and do what will make the most noticeable difference for you. The two-part teleworkshop is only $59 and includes everything listed to the left. You’ll register through Meggin’s secure shopping cart and upon check out, your registration will be acknowledged by email.